5793 labyrinths found. Showing 4161-4180. Sorted by country, state, city, then zip/postal code. Benches and additional trees to be added. 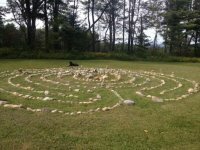 Labyrinth at Dawn. Please visit our Facebook page for more photos. 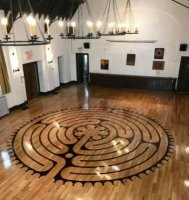 A walking meditation and physical place to assist you in finding peace, managing stress, making decisions, healing physically, emotionally and spiritually. Directions: Rt 9N Jay, NY, coming from the North, take a left onto Glen Rd, cross bridge over Ausable river, turn west onto Stickney Bridge Rd. (Essex Co. 64), turn right on Hazen Rd to 453 Hazen. Call for additional information if needed. Labyrinth is closed when it is covered with snow. From the Southern State Parkway take Exit 39S (Route 231). Take 231 to the end and make a right onto 27A West. NYS Thruway to Exit 39, take 690 east, getting off at the first exit on right, Jones Road. Take a right turn, and travel to the end of the road. At stop sign take a left turn onto Route 48/Maple Rd. Travel about 1/2 mile and turn left onto O'Brien Rd. About 1/4 mile on right is St. Augustine's Church, turn right into the parking lot, Labyrinth is located to the left as come into large portion of the lot. 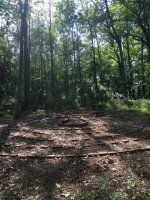 Park and walk, then sit and reflect in the Adirondack Chairs located near the Labyrinth. On the lawn behind the church around a large tree. Between the lake and Route 30, 100 yards north of the intersection with Route 28 in Blue Mountain Lake. Off Old Lake Shore Road. 30 minutes south of Buffalo. Exit 58 of New York Thruway. Call for further directions. Open from June through October. 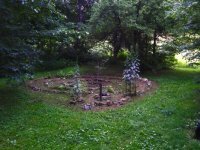 It is open for people to enjoy, but please give me a phone call to let me know you are on the property. #2 or 5 Trains to 149th Street AND Third Avenue (NOT 149th Street and Grand Concourse) Walk towards 145th Third, make a Left on 145th Street, walk towards Mercy Center. 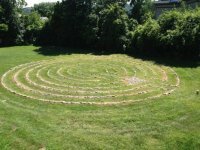 The Riverdale Labyrinth Walk at Christ Church is open every Tuesday evening (except holidays) from 6 - 8 pm.